This is a sponsored post written by me on behalf of Hidden Valley for IZEA. All opinions are 100% mine. Bryan and I have a small group of friends – us and two other couples – that we consider family. The boys and I were all friends in college, so when we moved to the Chicago area after graduation, we stayed connected. We experienced moving back home with the parents together as well as first apartments, new jobs, losing said new jobs, grad school, relationships, etc. They were our best friends and stood up with us in our wedding. We have thankfully added some more estrogen to the group, but our time together doesn’t look much different. 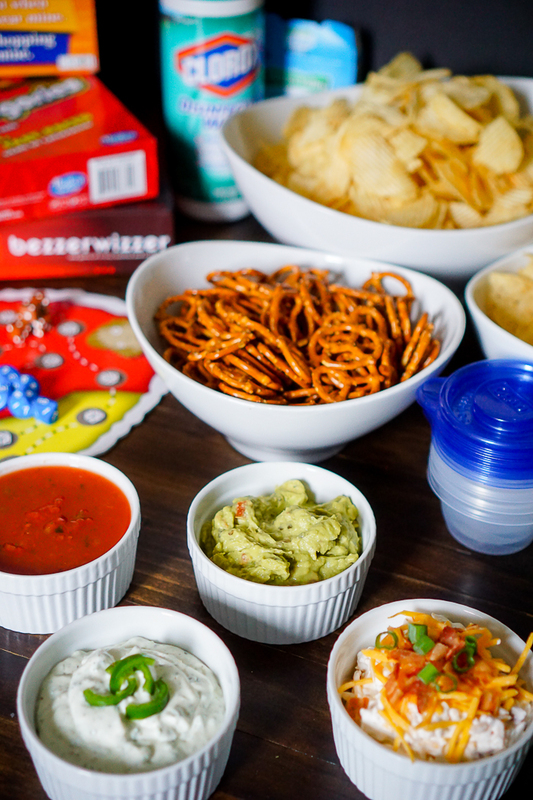 Game Nights – especially Chip Dip Game Nights – are still our favorite way to spend a night. We are board game people! We love hunkering down for the night with good eats and playing all different types of games. Over the years, we’ve definitely spent hours in a hour playing the same game repeatedly but the larger the group has grown, we also find ourselves playing more casual, fun group games, too. Bezzerwizzer – This game was introduced to us by two of our group – Matt and Shelby. It is a trivia game which I know can turn some people off, but this is not as intense as some other trivia games out there. First of all, you play on teams which makes it way more enjoyable to me. Then, there are different categories of trivia – including books, tv, sports, etc – and you don’t even have to answer a question from every category in a game. This is definitely worth playing! 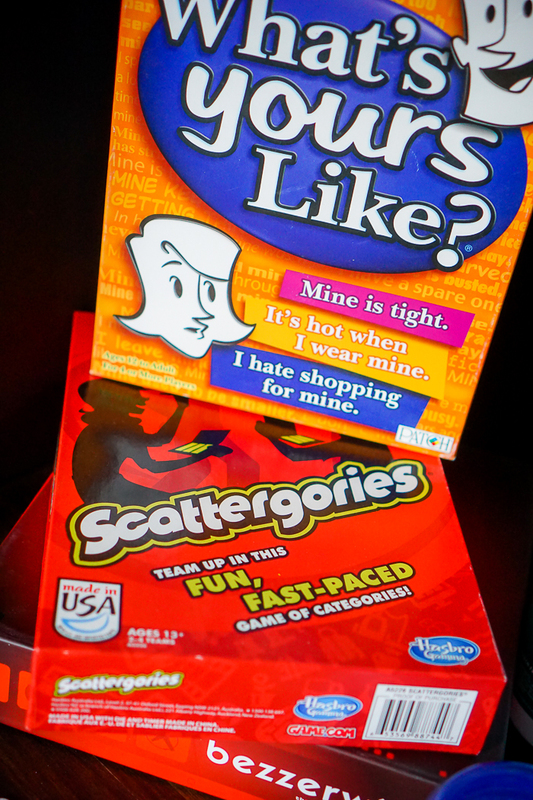 Scattergories – This is one of my family’s favorite games and the newest addiction for my oldest niece D. It’s a word game. You are given a list of clues/categories, such as girls’ names, things with spots, mascots, and then a letter. Write as many words down for each category that start with that letter. My favorite part of this game is reading through the lists and hearing the inventive answers people come up with! DICEcapades – Here you have a broad mix of elements that come together for the one game. You have dice games, physical challenges, artistic creations and trivia questions – which means there is something for everyone! What’s Yours Like? – Hands down my favorite ice breaker game for a big group. One person sits out for every round and is attempting to guess an item that everyone else knows and is giving clues for. For example, the word could be “nightstand” and people will want to give vague clues describing what their nightstand is like. One might say – I sleep next to this every night, mine is very small, mine is cold (because it’s made from metal), etc. The clues can get very funny and it’s a great way to get people talking about themselves! A game night is not complete without good food though! 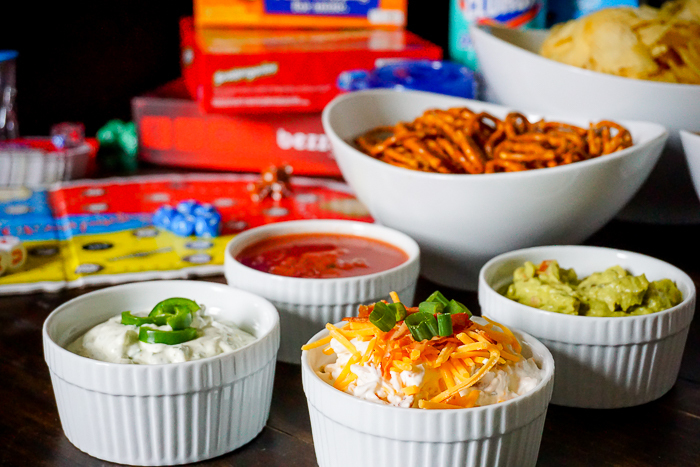 Because I want a game night with our friends to be relaxed, Chip Dip Game Night is definitely my favorite. I grab three different types of dippers – potato chips, tortilla chips and pretzels. Then, I usually buy a couple dips like a salsa to make things easy but make a couple others too. 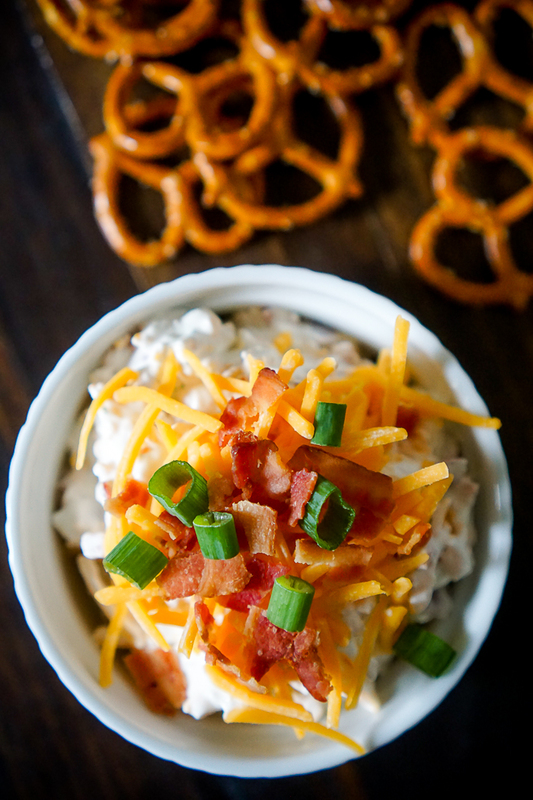 For this game night, I made my Loaded Baked Potato Dip which is a game night classic. I added a little twist and included some Hidden Valley Dry Ranch into the mix and it was delicious! 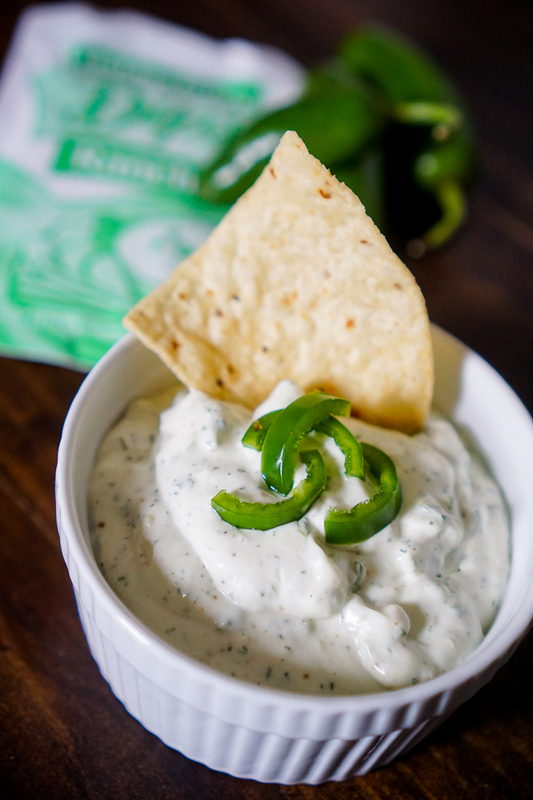 I also made a CREAMY RANCH JALAPENO CHIP DIP that has the perfect amount of subtle heat. This dip became an instant summer recipe for me, and I’m always thinking it will go really well on some chicken tacos! Oh the possibilities. When throwing a party like this, I recommend keeping two things on hand. 1 – The Clorox Company Wipes! As much as I love my friends and my husband, they are not always tidy. 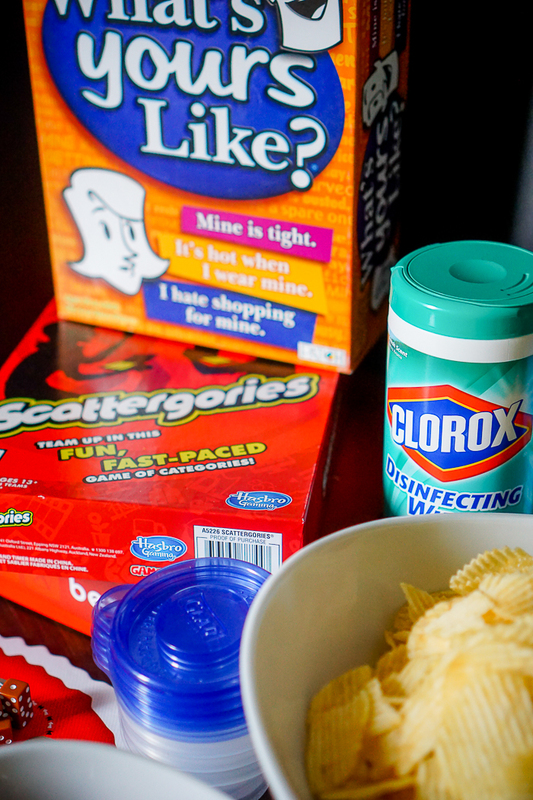 Spills are bound to happen so having wipes on hand make the clean up faster and easier so you don’t take away from all the game night fun. 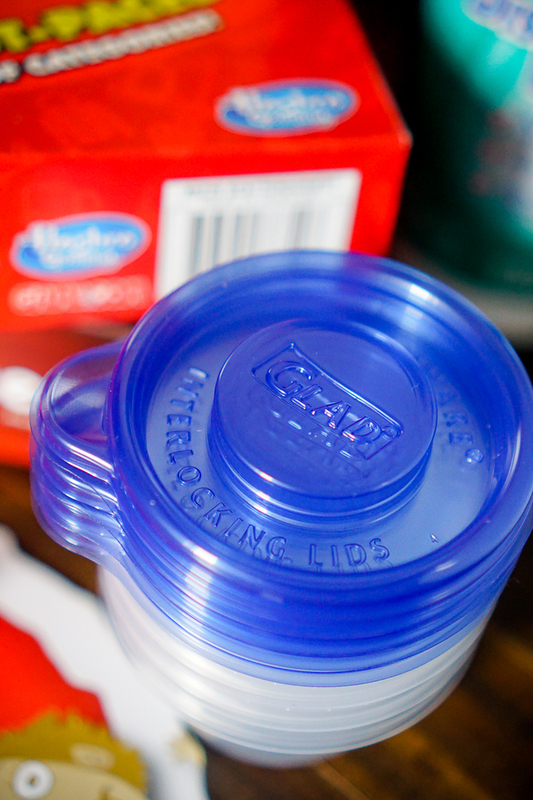 2 – The Glad Products Company To Go Containers. As much as I love chip dip and could eat it for days, I don’t need to eat it for days. Having little to go containers make it easy to share the yummy wealth and let friends take some home with them. Want to see some more examples of fun events with friends?! Check out some ideas on the Gather Now tumblr! So many cute parties.